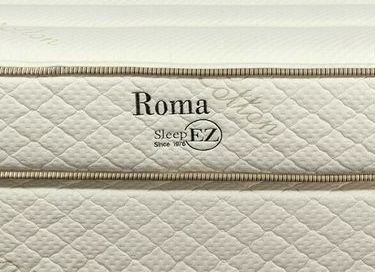 Our pick for the #1 best value latex mattress at $695 for a queen, the Sleep EZ Roma mattress is a 2-in-1 flippable mattress made of 100% natural Dunlop latex. The mattress can be flipped to provide either a firm or medium firmness. The Roma has 2 cover options. Choose from a 100% organic cotton cover with channel quilting or the naturally anti-microbial Joma New Zealand Wool cover. Sleep EZ developed a flippable mattress that is firm on one side and medium on the other. They have found that 95% of their customers prefer either a firm or medium feel. Maybe you don’t know which you prefer or maybe right now you really like a firm mattress, but as you age will need a softer mattress to alleviate joint pressure. The Roma easily accommodates your change in firmness needs with a simple flip and is one of the many benefits of the Roma. We have chosen the Zenhaven because both mattresses are two sided mattresses containing only latex. The major difference is the Roma has two comforts depending on which side is up. The Zenhaven has only one comfort for each side.